*Includes up to 6 quarts of Dexos Full Synthetic oil. Excludes Volkswagens and Volvos, and other models that require alternative synthetic oils. Motor oil helps keep your car’s engine running smoothly while reducing the wear on all its moving parts. Over time, oil begins to breakdown and wear out, making it less effective at lubricating your engine and transferring heat. When it is time for an oil change, Perrysburg Auto Mall has all your needs covered! You do not need to take your vehicle anywhere else! 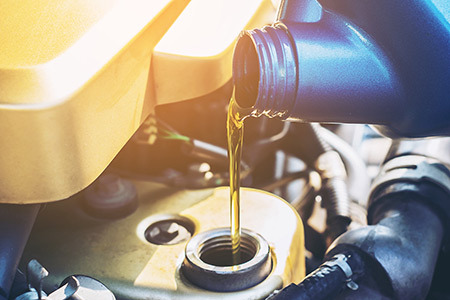 Perrysburg Auto Mall offers complete preventative maintenance services including regular oil changes for your vehicle, and we do it at the most competitive prices. Keep your engine running like new. Regular oil changes are the easy and cost-effective way to maintain your vehicle’s reliability and performance. Regular oil changes help your engine last longer and they can help with your vehicle’s fuel economy. When your vehicle is in for regular maintenance, we can help catch and fix minor issues before they turn into costly repairs later. How are Perrysburg Auto Mall technicians trained to do an oil change? We train our technicians to perform Perrysburg oil change services using a combination of our own e-learning and training guides along with on-the-job coaching and mentoring. We also have technicians on staff ASE certified in general maintenance. Knowledge and expertise. Perrysburg Auto Mall technicians are instructed to follow manufacturer and industry approved servicing procedures while following the most stringent safety precautions. Sticklers for detail. Using the latest technology, Perrysburg Auto Mall electronically provides technicians with individual vehicle specs for exact oil quantity and viscosity for your make and model. You do not need to make an appointment; however, we know how much you value your time. Scheduling an appointment will give you the benefit of servicing your car on your schedule. While we can change your oil on a whim, we cannot guarantee you will be serviced on the spot. That will depend on if—and how many—customers arrived before you. We can give you a heads up beforehand if you call us. Appointment or not, you will receive the same impeccable service and the same attention and care we provide each vehicle we service.